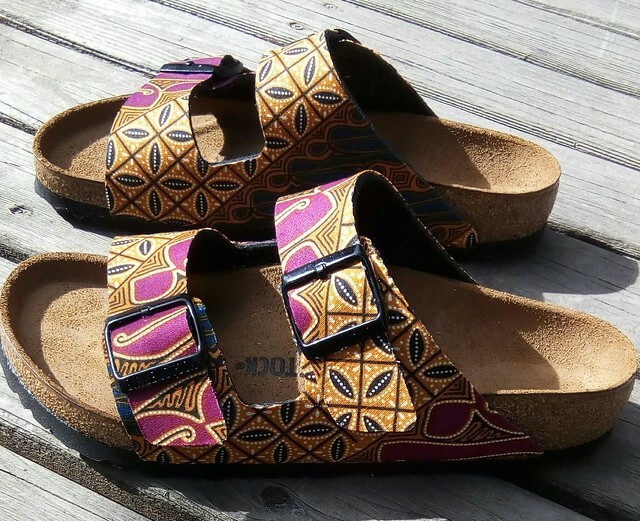 These were a pair of black, Birko-flor (faux leather) Birkenstocks that were very boring so I covered them in some Indonesian Batik cotton fabric. 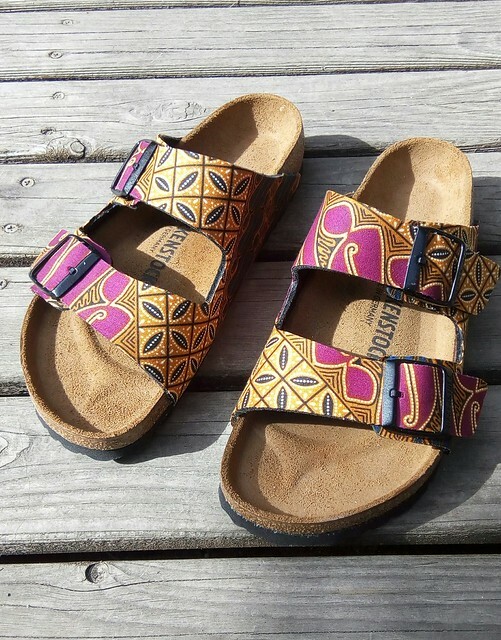 I used outdoor Modgepode and painted it onto the straps and pressed the fabric on to it. Once dry I used a craft knife to cut them around the straps. I left the area around the buckles until the end and cut a T shape into the fabric and pushed the fabric under the buckles. I put Dritz Fray Check Sealant around all the edges (and where the buckle holes are) and I sprayed the finished shoes with Scotchguard. I'm hoping they'll wear well but we'll see, I haven't tried this before and wasn't sure the best glues to use. These look great! From the photos you'd never know they didn't come from the store like this. I hope they hold up well so you can wear and wear them. I thought they were painted. Amazing job on adhering and cutting that fabric! I'd love to hear how they hold up. Kudos! You have to keep us updated on how they wear. I love the fabric you chose too. These are beautiful. Can I sew ends of shoelaces inside my sneaker?